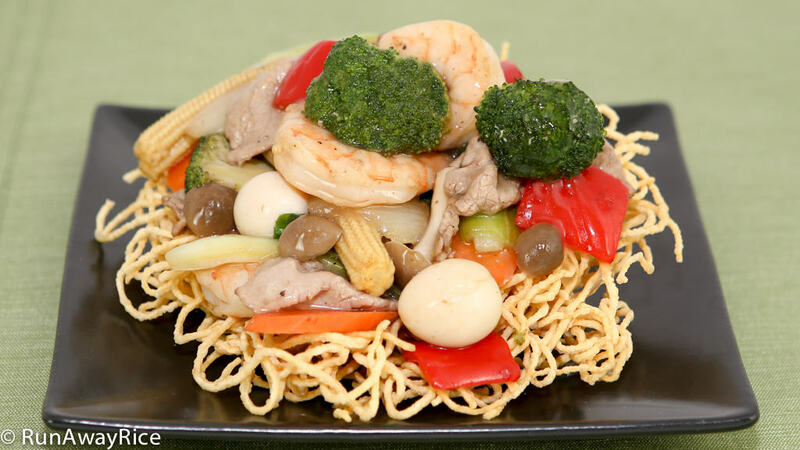 In this scrumptious dish, thin egg noodles are transformed into crispy golden nests, piled high with savory stir-fried beef, shrimp and crunchy vegetables and then topped with a light gravy. The combination of crispy noodle and savory stir-fry is full of flavor, texture and simply mouth-watering. This dish is a restaurant favorite because it seems too complicated to make but that’s just not the case. The next time you get a hankering for this dish, do yourself a favor–skip the restaurant (and save some money), and showcase your culinary skills with this easy-to-follow recipe. Enjoy! You can vary the meat and vegetables depending on your preferences. Love seafood? Add scallops, crab and squid. Alternatively, use tofu, chicken or pork instead of beef. What’s a nest without some eggs? I used the canned quail eggs for convenience. Optionally, hard-boil fresh quail eggs. If you can’t find quail eggs, use little fish balls and they’ll be just as tasty and appealing. The fresh egg noodle that I am using comes in a 1 lb package consisting of 4 bundles. I divide each bundle in half and make a total of 8 nests. They are a hearty size and measure approximately 6-inches in diameter once fried. The spider or skimmers I am using measure about 5-inches for the larger one, 2.5-inches for the smaller one. I bought these at my local Asian grocery store and similar spiders can be purchased online. The oil should be approximately 380 degrees Fahrenheit (plus or minus 5 degrees is okay). Use a thermometer to check the temperature or test by dropping a section of noodle into the oil. The oil should bubble vigorously and the noodle should puff up right away indicating the oil is hot enough. It takes just 8-10 seconds to fry the noodles. Don’t over-fry or the noodles will be really oily. If using dried egg noodles, boil first and air-dry for at least 1 hour. Then fry until crispy. I prefer potato starch as a thickener as it yields a smooth and creamy gravy. It also doesn’t turn watery or into a thick glob when refrigerated. You can also use tapioca starch, corn starch or all-purpose flour. If you love gravy, I would recommend doubling the recipe. If you enjoyed this recipe, you may also like: Stir-Fried Egg Noodles (Mi Xao Mem) and Stir-Fried Seafood Noodles (Hu Tieu Xao Do Bien). Combine the beef with soy sauce, oyster sauce, Vodka 5-Spice Marinade, vegetable oil, minced garlic and ground black pepper. Let marinate in the refrigerator. Season the shrimp with salt and pepper and let marinate in the refrigerator. Transfer the quail eggs into a strainer. Rinse with cool water to remove the brine and let drain. Cut the broccoli into florets and then into bite-sized pieces. Trim and core the red bell pepper. Cut into bite-sized pieces. Cut the onion into chunks approximately the same size as the peppers. Peel the carrots and cut at a slight angle into coins about 1/4-inch thick. Separate the bok choy leaves from the stalk. Trim off the end of the bok choy stalks and discard. Cut the stalk into thin strips. Separate the mushrooms from the root. Transfer the baby corn into a strainer and rinse with water. Take one bundle of noodle and gently loosen and separate the strands. Divide the noodle in half. Repeat the process with the remaining bundles making 8 batches. Fill a medium wok about 2/3 full with vegetable oil. Heat the oil over Medium High heat until it’s approximately 380 degrees Fahrenheit. Take the first noodle batch and arrange evenly in a large spider or skimmer. Place a smaller spider on top. Immerse the noodles in the hot oil and fry for 8-10 seconds or until they are puffy and golden. Transfer the nest to paper towels and allow to cool. Continue frying the remaining noodle batches, making a total of 8 nests. To make the gravy, first prepare the thickener by mixing together 1/4 cup chicken stock and potato starch in a measuring cup. In a small saucepan over Medium heat, add 2 cups chicken stock and oyster sauce and whisk together combining well. When the stock starts to boil, stir the thickener again to remove any settling and then add slowly while stirring the stock. Continue whisking everything well. Add ground black pepper and combine. Cook for another 2-3 minutes. Turn-off the heat and set aside and let the sauce continue to thicken. To make the stir-fry sauce, combine the chicken stock, soy sauce, oyster sauce, sugar and potato starch in a measuring cup. Heat a large wok over Medium High heat and add 1/2 tsp vegetable oil. Add the marinated beef and stir-fry until the beef is slightly pink. Transfer to a clean bowl. Clean the wok and again heat over Medium High heat. Add 1/2 tsp vegetable oil. Add the shrimp and stir-fry until it’s mostly cooked. Transfer to the same bowl as the beef. Over Medium High heat, add 1/2 tsp vegetable oil into the wok. Add the minced garlic and stir-fry for 15 seconds. Add the broccoli along with the water and stir-fry for 2 minutes. Add the carrots and stir-fry for another 2 minutes. Add the red bell peppers and onions and stir-fry for another minute. If the vegetables are dry add 1-2 Tbsp water. Add the bok choy stems and baby corn and stir-fry for 1 minute. Add the bok choy leaves, mushrooms and quail eggs and toss together. Mix the stir-fry sauce and pour on the stir-fry. Toss together combining everything with the sauce. Add the beef and shrimp, combine together and cook for another minute or so. Turn off the heat. Add the sesame oil, ground black pepper and toss together. 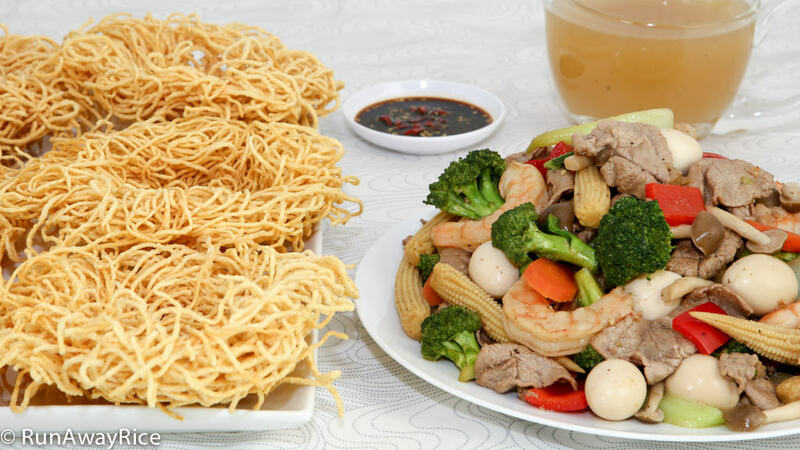 To assemble the dish, place one of the crispy noodle nests on a large plate. Fill the nest with the stir-fry piling it high. Drizzle a generous amount of the gravy on top of the stir-fry. Serve with a side of soy sauce and chopped chilies. Enjoy! Yummy these sound awesome.! thanks for sharing. This is a great weekend recipe to make for your family. Enjoy the recipe! Hi Trang, mi xao gion came out pretty good taste. Thanks a lot. Keep post some yum yum one.